The main screen display your portfolio. Slide the picker to switch the fund price history to be displayed. Turn the iPhone (or iPod touch) horizontally to view a larger version of the graph. Double-tap the graph (both in portrait and landscape views) to go to the fund’s website. You can configure funds from multiple fund supermarkets to be available for selection in the picker. 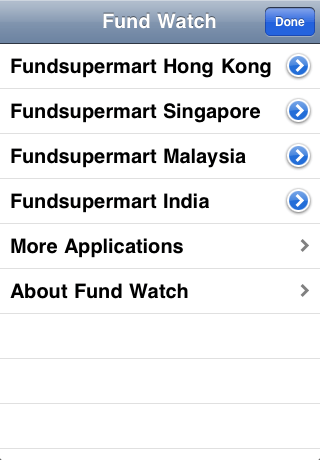 The fund supermarket name is displayed in the upper-right corner when the device is in landscape mode. Tap the “i” on the lower-right to configure the portfolio. Tapping on the “About” option displays program version information and a link to this website. When you have completed configuring your portfolio, tap on the “Done” button in the upper-right to return to the main screen. Tapping on one of the fund supermarket names displays a list of funds offered by that fund supermarket. The funds with a checkbox is available for display in the main view and likewise the ones without a checkbox will not be displayed. Tap on a fund name to check or uncheck. Swipe up or down to scroll the list. When you’re done adding or removing funds from this data source, tap the “Back” button to return to the fund supermarket selection box. Tap on the “Fundsupermart Website” button at the bottom to open Safari with the respective branch’s website. The Search box at the top of the list allows you to narrow down the funds displayed in the list. This allows you to find a particular fund faster. Type in a part of the fund name and only those funds with matching names will be displayed. Then you can check or uncheck the funds more easily.